Yesterday we shared our recipe for Edible Pretend Snow for Sensory Play and I mentioned that it only lasted overnight. We don't like wasting things - so I made the Pretend Snow with the intention of using it to make Bread Clay Ornaments. I'd heard of Bread Clay several times, but somehow I've never tried it. And it is SO NEAT. We are totally making these again next year. I think it's hands down the most vibrantly colored ornament dough we've ever tried (and we've tried a lot of them - we're big into DIY ornaments around here!). The dough is very, very dense. It looks like a playdough, and it is easy enough to break pieces off of, but rolling it out was a bit tough for S. I stepped in and helped with that part. Because the dough is so dense and sturdy, it was incredibly easy for her to do the stamping with the cookie cutters and to move the finished trees. Bread Clay doesn't tear or smear like other doughs we've worked with. 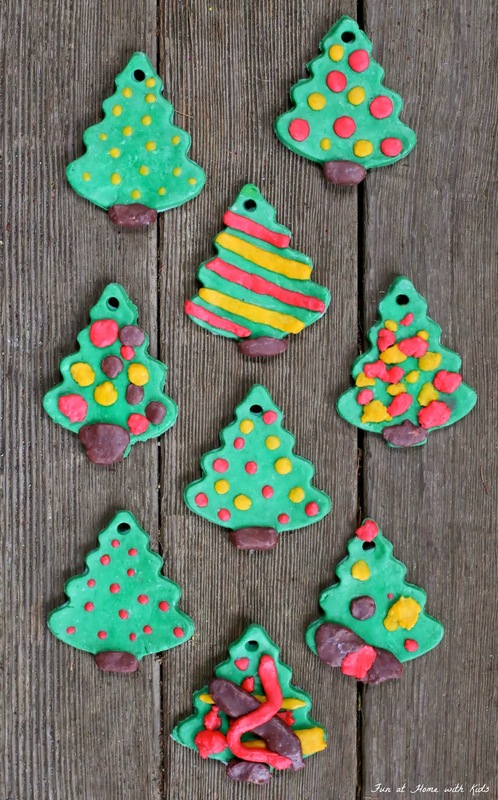 S wanted to make Christmas Tree ornaments - so naturally she wanted green dough. I told her she could choose a few extra colors for us to try and she wanted brown for the tree trunks and red and yellow dough for the ornaments. Despite being challenging for a 4 year old to roll out with a rolling pin, the clay was easy enough for her to manipulate into tree trunks and ornaments. We both really enjoyed the bright pops of color - the dough is just so vibrant! To make your own bread clay, you'll need some white bread. If you made our Edible Pretend Snow, your bread is already prepped. If not you can either tear the slices of white bread into small bits by hand (don't use the crusts) or you can add them to a food processor or blender. In my opinion using a blender to prep our bread made it way easier on us! Next portion out your bread "crumbs" into piles for each color dough you wish to make. Keep about a half a cup of plain crumbs to the side in case any of your doughs are too wet. Add color to your bread crumb piles. We used liquid watercolors - but food coloring would also work. Mix the crumbs a bit to distribute the color as best you can. Next add a few drops of lemon juice and work them through the crumbs. If you don't have lemon juice on hand, you can probably skip this part - lemon juice does inhibit mold, but if your house is warm and dry it might not be a problem for you. I've seen several bread clay recipes that don't even mention lemon juice. We had lemon juice, so we added several drops to each batch of colored bread crumbs. Finally add some glue to your colored bread crumbs. It really does not take much, so err on the side of adding too little. It can be whatever glue you want - we used Washable School Glue because it was what was handy. Add just enough glue that your dough barely holds together. And then knead. And knead. And probably knead a little bit more. The kneading to distribute the glue, break down the bread, and distribute the color took several minutes (longest with the bigger batch of green dough). I bet you could use a mixer to speed this part up, but I didn't want to put glue in our mixer so I toughed it out and did it by hand. If your dough is sticking to your hands - add more of the plain bread crumbs you set to the side and work them in. If your dough is not holding together and just crumbling everywhere, add small amounts of glue and work it in. Your dough should look like playdough and feel like a really dense version of playdough. We found that this clay did not really lend itself to rolling "snakes", so it wouldn't work well for an ornament like our Old Fashioned Candy Canes. But it works incredibly well for the traditional cookie cutter style flat ornaments. When you're done creating, lay your ornaments out to dry. It will take up to 48 hours for them to completely dry. We found that we needed to flip the ornaments at the 24 hour mark to allow the backs to dry. Once they are completely dry, we recommend adding a finish coat to seal them. We used Glue All to protect them against moisture and to secure any dough bits that had loosened (there were a few on S's ornaments that weren't pressed down well enough to stick on their own). Glue All dries clear and the final ornament photos above show the ornaments after that final sealing coat had dried. These were so much fun to make and we're so excited to have a new ornament recipe to add to our yearly repertoire! They came out so pretty! With the sealant, do they last from year to year? Thank you, Lyn! From what I've read - yes, they are supposed to last from year to year. It's our first year trying them, but with the glue sealing them and the bread totally dry - unless they get damp, I can't see how they wouldn't. They are very solid. i plan on bringing these in for a 2-year-old class to decorate with pony beads! great post!